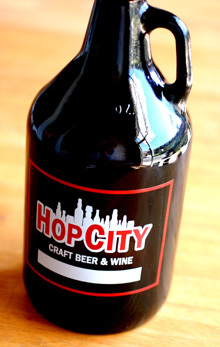 Hop City Craft Beer & Wine in Atlanta filled 503 growlers in the first three days it offered the 64-ounce containers to obviously eager customers last week. Hop City is the first retailer in metro Atlanta to sell the refillable glass jugs. Hop City sells the growlers for $4.99 and fills starting at $6.99. It sold 465 growlers in three days, with 503 fills (and refills) ranging up to $48.99 per growler. Hop City offers 16 beers on tap, and the lineup last week included Wild Heaven Invocation, a single-hop version of Victory Prima Pils and a Red Brick Whiskey-aged 16th Anniversary Brown Ale. The store stocks 1,700 beers. 1,000 wines and also sells homebrewing equipment.